TEA STREET Blog: Is quality and convenience possible? 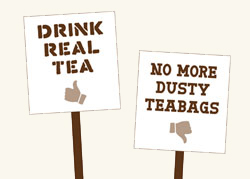 In my post ‘why was teastreet built?’ I pledged to blog about tea shops and tea brands that offer quality teas, after my rant about dusty teabags being commonplace. teapigs are a non-fussy tea brand that simply want to get the ‘nation drinking real tea’ and I expect many wouldn’t go back once they’d made the transition. You don’t have to be an expert to get into these teas, they’re meant to be for everyone. If you’re looking to drink real leaf tea, but as part of your day-to-day life, then teapigs tea might be for you! That’s not to say that teapigs aren’t ideal for occasions and as gifts (I bought the chocolate flake tea for stocking-fillers), but they’ve managed to place themselves in the market for both quality and convenience; no easy task. While their loose leaf tea is just as tasty, it is their tea temples that merge quality with convenience. They are useful because as much as we’d like to make the effort to brew loose leaf tea each day, we don’t always have the time or energy. The temples are biodegradable mesh bags that are spacious enough to allow leaves to stay whole, which preserves the flavour and prevents them becoming ‘dusty’. Before drinking from these temples I don’t think I ever saw a tea bag/temple with actual leaves in it! Going back to the post I mentioned, this really reminds you that you’re drinking from a plant when you’re brewing and the temples can just be chucked in the compost bin as well. On this green note, the packaging is fully recyclable and there’s information about their ethical scheme on their website. So far so good! Something I like about the teapigs website is that you can search tea types using the ‘mood-o-meter’. So you can search ‘stressed’ and up comes a list of teas to help with that, which reminds you that tea was/is often used for its medicinal properties. They also indicate what’s available to you, from recipes to accessories; so all the thinking’s done for you. I first came across teapigs when I was looking for Yerba Mate (pronounced Yerba Mah-tey) tea, which is a plant known to give you energy and focus but without the caffeine highs and lows that some people are sensitive to. I really loved the taste of this tea but imagine it’s not to some people’s taste; its kind of smoky and grassy! Funnily enough, Yerba Mate is teapigs tea of the month at the moment too, which is good as teapigs do my favourite Yerba Mate. At reasonable prices, you can get teapigs tea through their website and it’s worth signing up to their newsletter for current offers! You can also seek them out at your local shop or café or sign their petition to get teapigs ‘real’ tea sold there! So watch this space for teapigs tea reviews and feel free to add your comments here, on twitter or on the teastreetblog facebook page, where you can add pics too! Great post! Teapigs mint teabags are my fave, plus I've always been a sucker for their lovely packaging too. I don't like Teapigs because they are a Tetley (Tata) brand and are cheeky about coming clean on it. You could do better by supporting UK owned companies. Thanks for your comments! I will get on with some tasting soon. I will also make sure i cover the subject of independent vs. global tea companies as well. I've come across your blog via a Teapigs link and am loving it. My favourite Teapig is their Mao Feng which is brilliant! It looks like you are UK based, is that right? If so make sure you try here: http://www.teasmith.co.uk/ It's at Old Spitalsfield market, London. I especially like their ages Puer! They have an afternoon tea too but not tried it yet. So pleased you're enjoying the blog! I like the Mao Feng too, good choice! I am UK based and will keep your recommendation in mind next time i'm around that way.